Strong growth continues, revenues up 42% in reporting period. However, earnings below previous year due to project delays. Net income is slightly down. Kapsch TrafficCom AG, listed on the Vienna Stock Exchange, can look back at five successful years since its initial public offering in June 2007. In the past fiscal year 2011/12, which ended on 31 March 2012, revenues increased again by 42% compared to the previous year. This growth reflects, in particular, the progress of the two major projects in Poland and South Africa but also the successful expansion of business in the U.S.A. The volume of delivered on-board units significantly rose from 5.2m units in the previous year to 11.2m units. However, the fiscal year proved challenging as well. 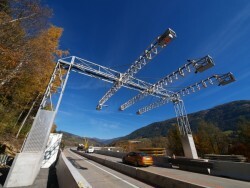 After an implementation period of only eight months, Kapsch TrafficCom started the operation of its major project in Poland at the beginning of the fiscal year, the nationwide electronic toll collection system viaTOLL for all vehicles above 3.5 tons, and completed it in stages up to the end of December. The system acceptance finally took place on 21 February 2012. Kapsch TrafficCom covered the ongoing expenses until this time, despite significantly reduced revenues from the operation of the system due to the delayed system acceptance. In the first quarter of 2012/13, for the first time, Kapsch TrafficCom will be able to generate revenues from operating the system according to the original contract. The net payment of € 103.3m for the last milestone of the system implementation received in April 2012 will also be reflected strongly in the free cash flow. In South Africa, the start of the electronic toll collection system for multi-lane free-flow traffic in the province of Gauteng has been delayed. At the end of April 2012 – just two days before the scheduled commissioning deadline – the start of the fully completed system in South Africa was suspended indefinitely by a court order due to a lawsuit. On 23 May 2012, the government elected to appeal the court decision. Although progress in both major projects impacted positively on revenues of the Kapsch TrafficCom Group, the delays clearly weighed down on earnings in the second half of the reporting period. In fiscal year 2011/12, Kapsch TrafficCom won new projects and markets, which shall support the continuing growth of the group: in July 2011, the investment into expanding the U.S. business was justified with a ten-year contract from the E-ZPass Group, operator of the world’s largest interoperable toll collection system. In Russia, the joint venture, in which Kapsch TrafficCom holds a 33% stake, won a contract to maintain and operate an intelligent transportation system (ITS), which encompasses a toll collection system as well as traffic information and management systems. The implementation and operation projects won in Belarus and Portugal also contribute to a positive outlook, as does the agreement with the French toll service provider Axxes in the global navigation satellite system (GNSS) technology as well as the basic understanding reached with Asfinag Maut Service GmbH on extending the operation and maintenance contract for the nationwide electronic truck toll collection system in Austria until the end of 2018. In fiscal year 2011/12, the Kapsch TrafficCom Group recorded the highest revenue since its foundation, continuing its growth from recent years. Revenues of € 388.6m in the previous fiscal year 2010/11 were improved by 41.5% to reach € 549.9m in fiscal year 2011/12. The operating result (EBIT) declined by 13.6% to € 42.2m in fiscal year 2011/12, compared to € 48.9m in the previous year. The EBIT margin was 7.7% in the reporting period, thereby missing the target of a two-digit EBIT margin. System implementation delays in Poland and South Africa made for disappointing developments with a negative EBIT of € -2.7m in the third quarter, followed by weak but positive developments in the fourth quarter. Revenues in the segment Road Solution Projects (RSP) reached € 229.9m in the 2011/12 fiscal year, up by 44.7% compared with the previous year (EUR 158.9m). The most important factor in this improvement was the contribution made by the project in Poland. In the segment Services, System Extensions, Components Sales (SEC), revenues increased by 37.9% from € 223.3m in the previous year to € 308.1m. The 22.8% decrease in EBIT from € 48.3m in the previous year to € 37.3m in 2011/12 largely reflects the delays in the two major projects in Poland and South Africa. However, the EBIT margin in the segment SEC was still 12.1%, though well below the 21.6% figure from the previous year. Profit before income taxes reached € 36.3m, down by € 4.9m compared with the previous year. Lower income taxes and higher financial income compensated for the lower operating result (EBIT) and led to an almost unchanged profit for the period of € 27.5m (2010/11: € 28.4m) and to earnings per share of € 1.62 (2010/11: € 1.81). The executive board will make a proposal to the shareholders’ meeting on 24 August 2012 calling for the approval of a dividend of EUR6nbsp;0.90 per share (2010/11: € 1.00 per share) for the fiscal year 2011/12. This proposal reflects a payout ratio of approximately 57% in relation to the profit for the period attributable to equity holders of the company (2010/11: approximately 55%). Total assets increased in the reporting period, largely as a consequence of the augmented project business, the capital increase at the end of July 2011 and the total comprehensive income for the period. The equity ratio of the Kapsch TrafficCom Group thus increased to 45.9% as of 31 March 2012 (31 March 2011: 42.5%). The high project-related net working capital was instrumental in the free cash flow declining to € -50.9m after € -19.9m in the previous year. However, the payment received from the project in Poland in April 2012 – after the reporting date – will significantly reduce net working capital and improve the free cash flow in the first quarter of 2012/13. Despite a macroeconomic environment that remains challenging, Kapsch TrafficCom takes an optimistic view of its markets for fiscal year 2012/13 and beyond. The company is convinced that there are many interesting opportunities worldwide for the delivery and operation of toll collection systems and that it is well prepared for the increasing convergence of the ITS market. Fiscal year 2012/13 will be characterized in particular by further developments associated with the date for the start of the electronic toll system for multi-lane free-flow traffic in the South African province of Gauteng as well as the expected tenders for nationwide electronic toll collection systems in Hungary, Slovenia and Denmark. The company will also focus during fiscal year 2012/13 on implementing the strategy up to 2016, as defined in fiscal year 2011/12, and on establishing the corresponding corporate structure.